The SMK is a premium Rank II Soviet heavy tank with a battle rating of 3.7 (AB/RB/SB). 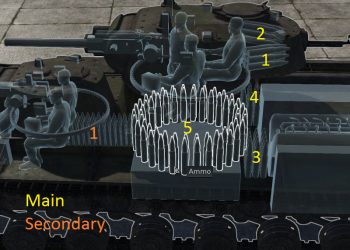 It was introduced in Update 1.45 "Steel Generals". The SMK was named after Sergei Mironovich Kirov, an early Communist Party official who was assassinated in 1934. 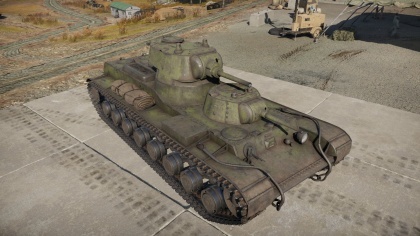 A twin-turret heavy tank, the SMK provides an interesting play style to its users. Only one prototype was built before the project was dropped. Column elevating main turret is 60 mm thick with a range of 12-18° of slope. Ammo racks for the SMK. Confidently stand against most enemy tanks especially if they are without support, use caution against engaging multiple targets from a distance however as a track hit will end any day on the battlefield, the SMK packs its biggest punch up close and cannot expect to survive against sniping units if caught in the open. Keep the tank moving as much as possible and slightly angled facing enemies direct. When engaging heavies it's best to not go toe to toe head on however by disabling a track or turret the SMK can hold itself up in close proximity to most heavy enemy tanks. HE and shrapnel shells are not this tanks forte, rather its APHE rounds ussually due the trick against most enemy units. Attack and break enemy lines, The SMK is very much a tank worthy of entitling "Not one step back"! A fast load rate and dual turret firing system allow this tank multiple scores even when surrounded or disabled, and the sizeable crew enables quick repair, which is great as its size makes the SMK a juicy target that is more than capable of withstanding incredible amounts of damage. Great at providing weaker units cover and protection from enemy fire, the one two punch of its cannons reward players that love using more aggressive playing styles. The development of the SMK began after the T-35 heavy tank flaws came to light. The T-35 was unreliable and expensive, so the project was made to replace it. The project was headed by former OKMO designer N. Barykov and started in 1937 at the Bolshevik Plant with a specification that the tank could withstand 45 mm hits from point-blank ranges and 75 mm artillery at 1,200 meters. The design drawn up in 1938 was still a multi-turret design like the T-35, but the number of turrets were reduced to just two and a wide-track torsion-bar suspension was utilized instead of a spring suspension. The SMK was also redesigned to two different prototypes, the one with two turrets and the other with a single turret installed instead. These two designs were approved by Stalin and the single turret one was named after then Soviet Defense Commissar Kliment Voroshilov as the KV, the forerunner for the KV-1 heavy tanks. The SMK design weighed 55 tons and had two turrets mounted with one in front of the other, with the one in the mid-hull area as the main turret and the one in front as the secondary turret. The main turret was mounted higher than the secondary and had the 76.2 mm L-11 gun mounted while the smaller one had a 45 mm 20-K gun mounted. The design was powered by a GAM-34BT engine that produces 850 hp for the vehicle. The tank suspension was a torsion-bar suspension for improved smoothness over other suspension designs. Armour on the front hull was 75 mm thick in the front and 60 mm on the sides. As part of the heavy tank evaluations, the designs submitted for the project were to be battle-tested. The SMK, two KV-1, and two T-100 prototypes were sent to Finland during the Winter War and took part in the Battle of Summa. These vehicles formed the 91st Tank Battalion in the 20th Heavy Tank Brigade. The SMK, however, was immobilized by a Finnish anti-tank mine during combat and because of its heavy 55-ton weight, attempt at recovering the vehicle failed and had to be left behind for two months before Soviet forces could break the Finnish defenses to secure it. Before being recovered, the Finnish were able to document and photograph the SMK thoroughly. 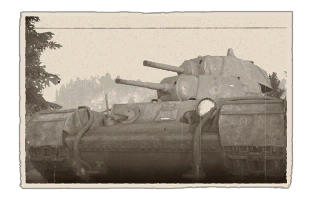 When German intellegence discovered the SMK, it was designated the T-35C, which caused the misunderstanding that the T-35 also took part in the Winter War when it did not. The failure of the SMK in the Winter War in contrast to the success of the KV-1 prototypes caused the KV-1 design to be accepted into service in December 19, 1939 as the Soviet's main heavy tank. The SMK thus never reached pass the development stage and was left with only one prototype produced. Skins and camouflages for the SMK from live.warthunder.com. This page was last edited on 11 January 2019, at 22:58.